Join me! Get ARC opportunities! Deleted chapters! Book Recommendations! Hi. 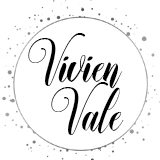 My name is Vivien Vale (but you already knew that) and I've wanted to write steamy romance novels ever since I used to sneak them from my moms bookshelf when I was a kid. I wasn't able to until recently. I have two little ones that I work hard at adulting for and being a Mom throughout the day. But when they go to sleep, Viv comes out as my naughty fantasies come out to play. Thank you! I look forward to entertaining you!